Excessive weight is usually the result of a deeper, less obvious problem. Some problems causing weight gain are depression, anxiety, stress, tension and low self esteem. When people use will power to cut calories and start exercising, the results are usually drastic and short lived. 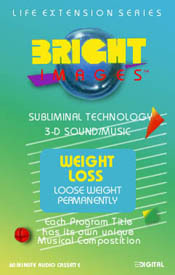 Most of us who loose weight through will power will, unfortunately, regain the weight we lost and more. The reason: we don't do anything about the cause. The mental problems that cause excessive weight need to be handled first if reducing caloric intake and exercising are to be effective. This program was designed to instill new concepts in the subconscious mind. Concepts regarding nutrition, exercise and eating habits, as well as new ideas regarding self-image, attitude and confidence to achieve success. Statements are directed to the subconscious to help reshape your thoughts and notions about food and how it affects your body functions to naturally eliminate excessive caloric intake. Have Total control over food and its effect on your body.